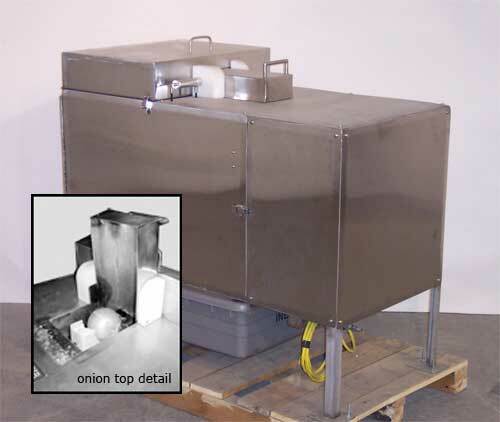 Designed to Top, Tail and Peel one jumbo onion every 6 seconds - up to 500 lbs. per hour. The operator simply takes an onion, places it in the holder, closes the door and in one swift movement the onion is topped, tailed and peeled. The peel is discarded into the totes below and the cleaned onion is discharged from the end of the machine into a tote or conveyor. This Top & Tailer Peeler can handle from 2� in diameter to your largest jumbo onion. Includes 2 totes. This one does it all! Tops, tails and peels! Click here for our Onion Peeler.